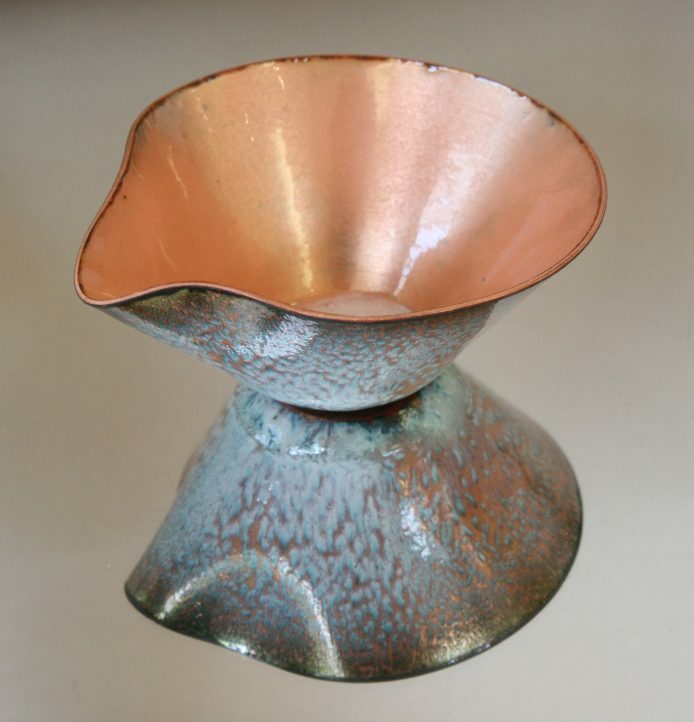 David’s work is vitreous enamel on copper, mostly spun bowls and small panels. Repeated firings in the kiln melt the enamel, which is specially formulated powdered glass, until it fuses to the underlying metal. After a career teaching biology, he was drawn into enamelling not long before retiring and since then has become heavily involved with the Guild of Enamellers (guildofenamellers.org). At present he is Guild Secretary on the executive committee and also the Guild’s photoarchivist and website editor. He has shown pieces in guild exhibitions and also has pieces on display in the Williamson shop. David’s approach is highly experimental and, using techniques of “high firing” and “fall-through”, the pieces are taken to much higher temperatures than normal to encourage chemical reactions between the enamel and the copper. This causes new colours and patterns to emerge in unpredictable ways so that every piece is unique. For the gold in this bowl, a form of enamel flux was used, but the gold colour only develops when the bowl is glowing almost white hot. Too cool and it just comes out brown. Meanwhile patterns develop on the outside from separate coatings of a pure white and flux which interact in the molten state. One sinks down and the other floats up to create the mottling, but the white will also burn away completely if it gets too hot!